Haiti Still Hasn’t Recovered From Hurricane Matthew. Now Here Comes Irma. The storm has huge implications for 50,000 Haitians living in the US. Even an intense rainstorm can cause death and destruction in Haiti, a Caribbean country of 11,000 square miles and nearly 11 million people. Now Hurricane Irma, a powerful and extremely dangerous Category 5 storm, is expected to hit parts of the country early Friday morning. Still recovering from Hurricane Matthew, which struck the southern coast last October, Haiti is bracing for the worst. Haiti is no stranger to hurricanes, but none have been as powerful as Irma. There have only been six major hurricanes (Category 3 or higher) in the country since 1851, and never a Category 5. In previous circumstances, when a storm was bearing down on the island, officials kept people informed via radio, television, and social media. Since Irma could be unlike anything the country has seen before, the Haitian Civil Protection agency has been proactive in warning people to take precautions. In Haitian Creole, the agency has used social media to urge residents to tell their friends, family, and neighbors that a storm is on the way. Other graphics warn that strong winds can knock tree branches down and warn residents to cut the branches that are close to homes and power lines. Civil Protection also advises people to make emergency kits with treated water, baby food, nonperishable foods, batteries, soap, flashlights, and important documents such as identification cards and passports. Even if Irma only skirts by Haiti, widespread damage is still likely. Many homes are poorly built shacks and can’t withstand hurricane force winds. Rampant deforestation, the result of cutting down trees for homes and firewood, has made the effects of the storms more deadly. With no trees to stop raging waters, intense rainfall has caused mudslides and deadly floods, which can level shoddily built homes and cause even more injuries and fatalities. 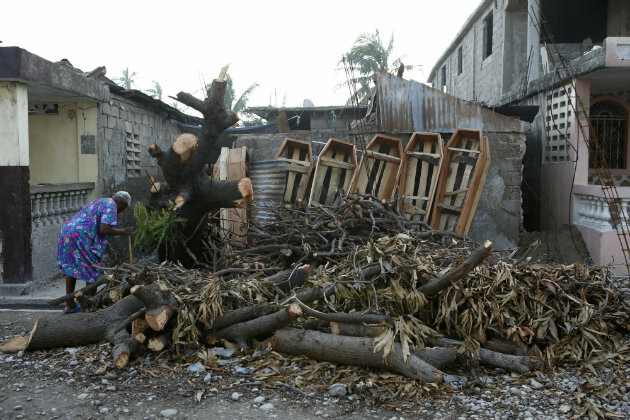 In four weeks of 2008, four storms—Fay, Gustav, Hanna, and Ike—decimated Haiti’s agricultural production, flooded towns, killed close to 800 people, and destroyed or damaged nearly 100,000 homes. Hurricane Hanna was particularly devastating, killing more than 500 people and dumping flooding rains in the northern part of Haiti—the same area Irma is likely to hit hardest. Not only is Haiti still recovering from previous disasters, but Haitian nationals living abroad are also facing a potential forced return to the island. The Trump administration decided in May not to renew the temporary protected status (TPS) program that allows them to work and live legally in the United States. After a devastating 7.0 magnitude earthquake leveled buildings and killed an estimated 300,000 people in 2010, the Obama administration granted to Haitians this special reprieve for foreign nationals whose home countries have experienced a humanitarian disaster. Since then, an estimated 50,000 Haitian nationals have taken advantage of TPS to work and live legally in the United States. TPS is typically renewed on a 6- to 18-month basis, and given the ongoing recovery process from multiple disasters, the Obama administration regularly renewed the status for Haitians. The latest renewal is set to expire in January 2018, and the Trump administration has signaled that it will not be extended beyond that date. Tens of thousands of Haitians already faced returning to a poor country unable to absorb them. Some have even fled to Canada because of false rumors that the Canadian government was offering free residency to Haitians with or without TPS. Critics of the decision have said Haiti is still reeling from the aftermath of the earthquake, a cholera outbreak unintentionally caused by the United Nations, and Hurricane Matthew, which came ashore on the southern coast of Haiti last October and killed around 900 people. A woman cleans debris around a home after Hurricane Matthew struck in 2016. In August, Rep. Bill Nelson (D-Fla.) sent a letter to the Department of Homeland Security urging the agency to extend TPS for Haitians because of Hurricane Matthew. “[Its] destruction compounded these problems and created new ones, killing more than 1,000 people, devastating Haiti’s infrastructure and agricultural system, and leaving many Haitians without a secure supply of food or shelter,” he said. Hot on Harvey’s Heels, Hurricane Irma Is Gathering Speed. Here’s What You Need to Know.